SAN RAFAEL, CA--(Marketwired - November 15, 2016) - PAC Machinery, a leader in the heat sealing and flexible packaging industry, announced today that they have returned from PACK EXPO 2016 having achieved their stated goals for the 4-day event hosted at Chicago's McCormick Place. The event showcased products from each of the PAC Machinery companies: Packaging Aids, Vertrod, Clamco, Rollbag Systems and Converting Technology. The nearly 4000 sq. ft. PAC Machinery exhibit enabled hands-on demonstrations as well as access to detailed product information on each of nearly thirty individual products on display. Machines on display included: automatic baggers, bag sealers, vacuum sealers, medical bag and pouch sealers, vacuum chambers, shrink packaging equipment, L-bar sealers, flow wrappers plus packaging equipment designed specifically for e-commerce and order fulfillment. "PACK EXPO is ideal for introducing our newest product offerings in an environment where our prospects are the most receptive," remarked Greg Berguig, V.P. Marketing at San Rafael, CA-based PAC Machinery. "We enjoy the opportunity to reunite with old packaging business friends and establish new relationships as well," continued Berguig. Early numbers indicate that slightly over one thousand visitors passed through the PAC Machinery exhibit over the four-day event. Adding to the interest generated by the new products, PAC Machinery introduced a promotion entitled: "Where's Jeff? The game challenged visitors to match cleverly marked machines (a postage stamp-sized picture of Thomas Jefferson) with a list of discreet machine functions. The prize for each of eight correct answer was a U.S. Thomas Jefferson $2 bill. The company awarded nearly $800. PACK EXPO provided an exceptional opportunity for introducing the new Rollbag Magnum HS Med validatable medical bagger and the Vertrod PS Medical Sealer with MedLogic controller and interface. These new medical machines are designed for a cleanroom environment and can package medical products using Tyvek® or other suitable materials designed for sterilization. PAC Machinery has introduced the new Clamco 8L, large scale, heavy duty L-bar sealer and shrink tunnel for doors, windows and long panels. 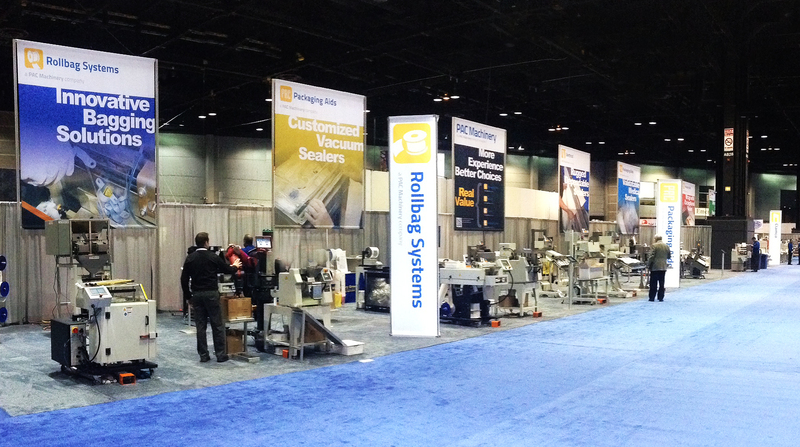 From the PAC Machinery show floor at McCormack Place in Chicago, IL USA. The nearly 4000 sq. ft. PAC Machinery exhibit enabled hands-on demonstrations as well as access to detailed product information on each of nearly thirty individual products on display.